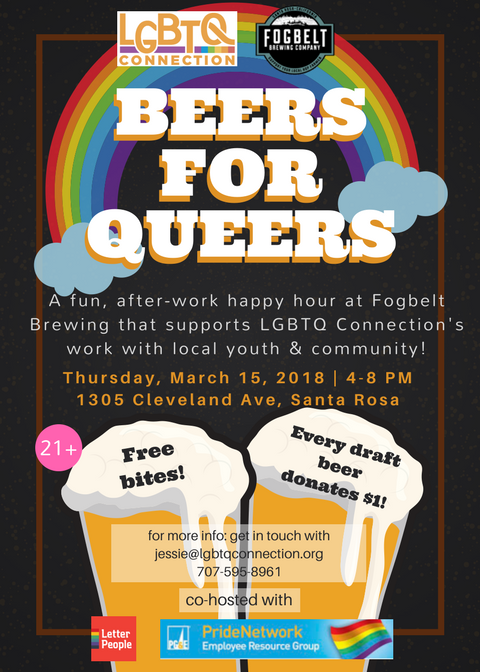 LGBTQ Connection, together with Letter People & the "Pride Network", PG&E's LGBTQ employee resource group, are co-hosting this fun, after-work happy hour at Fogbelt Brewing in Santa Rosa! Thursday, March 15, 2018 from 4-8pm, every draft beer purchased donates $1 in support of LGBTQ Connection's work with local youth and community. Free bites will be served! Come have fun, delicious beer, meet new people, and support growing a more diverse and inclusive community! For more information, contact jessie@lgbtqconnection.org or at 707-595-8961.